Games Hope is the name of a rugged glen to the south of the Talla Reservoir, Tweedsmuir parish, Peeblesshire. It is only accessible to walkers. 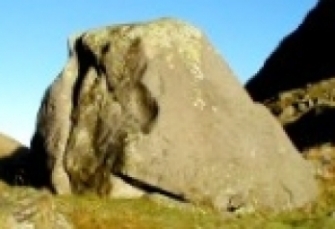 Within Games Hope is a large natural rock outcrop known as Peden's Pulpit, associated with the famous Covenanting minister, Rev Alexander Peden. Games Hope, because of its remoteness, was a popular hideout for Covenanters. It is referred to by James Hogg in his Covenanting novel, The Brownie of Bodsbeck, which starts with the line, 'It will be a bloody night in Gameshope'. There appears to be no confirmation of Peden having preached,here, though it is known that he attended Conventicles at nearby Talla Linns. A branch glen at the head of Games Hope is known as Donald's Cleuch. This is said to be a reference to Rev Donald Cargill, another Covenanter minister. Others who used the len as a hideout include Alxander Shields, Michael Shields and Rev James Renwick.